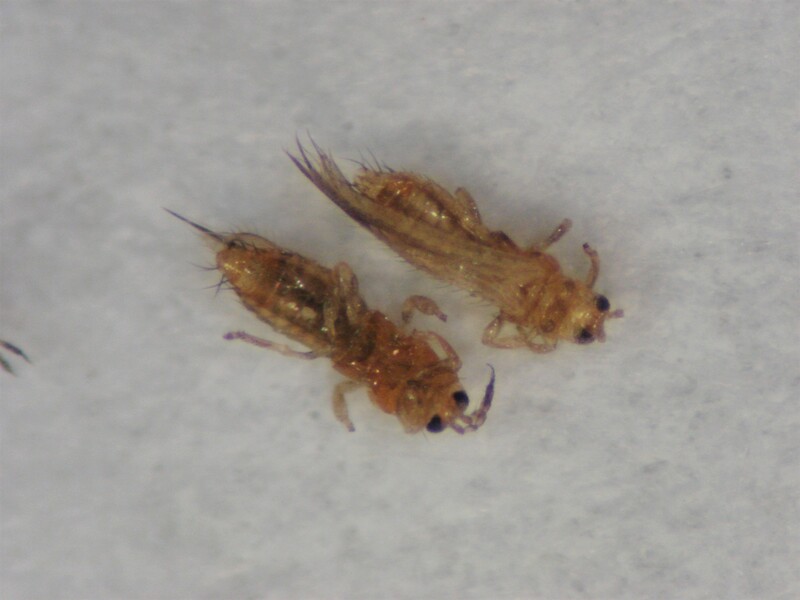 Immature thrips look like the adults only smaller, without wings and lighter in color. Pest description and crop damage Adult thrips are small (about 0.04 inch long at maturity), slender insects with fringed wings. They are generally white when young but brown or black when mature. Larvae are very tiny and difficult to distinguish without magnification. In apples, thrips feed on developing fruits which causes a white "pansy spot" to develop. 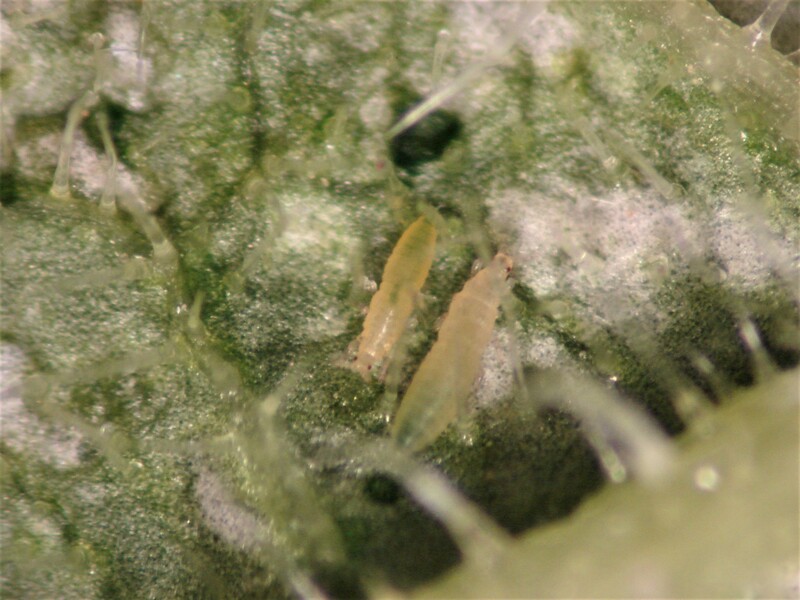 Biology and life history The western flower thrips has several generations and is a widespread problem on tree fruits and other crops in the Pacific Northwest. Damage to apples is during bloom, when female thrips lay eggs into developing fruit. A pale area, known as "pansy spot," develops around the scar where eggs were deposited, and is especially noticeable on light-skin apple cultivars. If only one spray is applied, pink and petal fall timings give equivalent control. The pear thrips has only one generation and destroys the fruit buds and flowers of fruit trees during bloom. This pest has recently become a localized problem in the mid-Columbia fruit-growing area, especially in orchards that border habitat with native hosts such as maple and other deciduous trees. Use a beating tray during pink stage to monitor and detect immigrating pear thrips along border rows of orchard. Pear thrips is best controlled at early pink. Manage weedy vegetation within and around the orchard (especially blackberry, mustard and radish). Do not mow cover crops or weeds, since mowing may cause thrips to disperse to the fruit trees. kaolin-Applied as a spray, it acts as a repellant to target pests. Some formulations are OMRI-listed for organic use. lambda cyhalothrin-Highly toxic to bees. plant-derived essential oils-Some have shown efficacy against thrips. Some formulations are OMRI-listed for organic use. Chromobacterium subtsugae (Grandevo) at 2 to 3 lb/a. Under heavy pest populations, apply a knockdown insecticide prior to use or in a tank mix, use the higher label rates, shorten the spray interval, and/or increase the spray volume to improve coverage. REI 12 hr. OMRI-listed for organic use. spinosad (Entrust 80WP) at 2 to 3 oz /a in up to 100 gal water per application. Do not exceed 9 oz /a per season. REI 4 hr. [Group 5] OMRI-listed for organic use.